In honour of National Nutrition month, we have compiled a list of 6 insanely healthy foods that every health nut should be consuming. We also brainstormed great ways to seamlessly incorporate these foods into your daily diet. Bon Appetit! Bone broth is an excellent source of immune system supporting minerals. They contain a wide range of healing nutrients including collagen, glutamine, glycine and proline. These nutrients help to reduce inflammation and heal the lining of your gut. This is important 1 because most of us have compromised gut health caused by unhealthy diets, medications, pesticides, chlorinated water and antibiotic use. The collagen in bone broth helps to seal up holes in the intestines, boosts joint health, and enhances skin, hair and nail health. Try: You can make bone broth with any animal bone or a combination of bones (beef, chicken, turkey etc.). Just throw them into a large pot, add water, bring to a boil and simmer for 4-6 hours. Consider adding two tablespoons of apple cider vinegar to the water, to help draw the nutrients out of the bones. 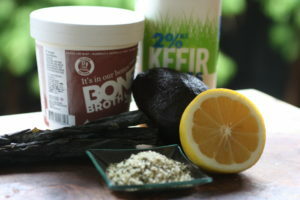 Use the broth to make soups, add some to your smoothies, or simply sip it warmed and straight-up. Try: Squeezing lemons onto your soup and salads, adding lemon and black pepper to tomato or Clamato juice, drizzling fresh lemon juice onto your chicken, or adding lemon juice to green tea (the citrus can increase the absorption of the teas antioxidants by up to 80%). Try: Crumbling dried sea vegetables over soups and salads, sauteing fresh sea veggies such as kelp in a spoonful of organic butter, adding them to stir fries or mixing them into your salads. You can also make a sushi bowl by chopping up avocado and whatever veggies you have lying around, adding sticky rice and crumbling dry nori into the bowel. Many people avoid avocados because they fear the high fat content, but we’re telling you right now, the fats in this superfood will not make you gain weight! Avocados are low in carbs, high in protein and a great source of the monounsaturated fatty acids — oleic acid. Oleic acid is a healthy fat that reduces inflammation, enhances wound healing, boosts immunity and enhances cardiovascular health.4 Avocados also help to reduce unhealthy cholesterol levels and they contain twice as much blood pressure lowering potassium as bananas. Try: Adding avocados to your smoothies, or making homemade guacamole by mashing using ripe avocado, lime juice and sea salt. You can also add a scoop of greek yogurt to the guacamole for a creamy probiotic containing dip. Sliced avocados makes a great salad, sandwich and burger topping, and are also great on their own, when sprinkled with a little sea salt. Try: Choose a low sugar kefir from your local grocer and try adding it to your smoothies or using it as a salad dressing base. You can also use it to make healthy popsicles by blending together and then freezing peach, kefir, almond milk, cinnamon, vanilla and stevia or maple syrup. Or, use kefir to make creamy pasta sauces, mix some into your oatmeal, or simply drink it straight-up, for your daily dose of probiotics. Try: You can eat hemp seeds raw or toasted and they taste great when sprinkled into yogurt, salads, and cereals, or added to smoothies. You can also consume ground hemp seeds as a healthy alternative to peanut butter, or drizzle hemp seed oil onto your salads. 3 Linus Pauling Institue, Mircronutrient Information Center. Therapeutic effects.